I'm really excited to do this review for you all. This product applies both to makeup artists and personal makeup users. How to sanitize your makeup. I find myself to be a bit of a germaphobe when it comes to my kit and applying makeup on others. I use palettes and spatulas for all my cream products. I never double dip my disposable applicators and I use alcohol with a vengeance. However, I always found it difficult to sanitize my powder products. 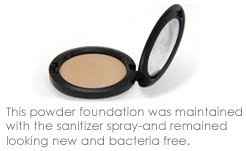 With powder products, bacteria usually doesn't penetrate beneath the top surface of the makeup. Never spray powder products with alcohol. This will ruin the surface of the shadow by producing a hard, cakey layer that will be difficult to scrape off. That means, all you have to do is take a tissue and wipe off the top layer of the product in order to sanitize it. However, when you have dozens of palettes with eyeshadows, blushes and the works...it's hard to get to sanitizing everything. It gets messy and you go through a lot of tissues...get a lot of makeup dust fall-out and it's overall a mess. This is me speaking from experience. In the last year, I heard about the Beauty So Clean products. It's a spray or wipe that combines sanitizing agents with emollients in order to disinfect your makeup without messing up the surface. I was so excited to try this out! I actually purchased the Pro Size Sanitizing Mist and a Travel Size one for my kit. I have extremely sensitive skin and I'm prone to eye infections and lip irritations. Those of you who have the same problems or who experience acne breakouts from makeup should pay close attention to this product. Cleaning your makeup brushes does not ensure that your makeup is clean. Bacteria transfer from our face to the brush and the makeup...as well as oils from our fingers. Sneezing and coughing can also infect your makeup. Click here to check out my review and see how to win! Check out my video review and demonstration of how to use the product! 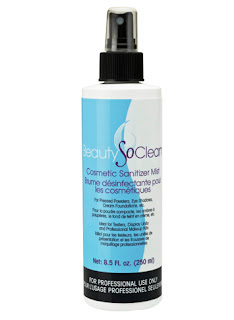 The website states to hold the Cosmetic Sanitizer Mist 6 inches from product surface and mist once. Don't be like me and oversaturate the product thinking it will work better. You'll just waste the solution and make the makeup sticky. I tested the product on literally all my powder and cream products. In the video, I use a blush palette to demonstrate. I notice that as soon as I sprayed the product, I could see the little droplets on the surface of the blush. However, within 10 seconds (the recommended drying time) the droplets dry and disappear and the product is good as new. The spray does not affect the surface of the product or change the color at all. The website also gives a great example of how your product looks with and without sanitizing. Oils from your skin and skincare products ultimately wind up on the surfaces of your makeup, leaving bacteria behind – the results of this oil build-up (glazing) can be seen on this pressed powder. When this happens, you run a greater risk of experiencing breakouts. The product is harder to work with because of the glazed surface and you find yourself having to dig the brush into the pan to get it out. Or you find yourself trying to scrape off the oily residue which makes the finish rough and wastes product. Using the spray sanitizes your makeup and keeps it looking new. I actually purchased the Pro Size sanitizer spray as well as the Travel Size from http://www.alcone.com/. I used them for weeks and loved them. Then I received samples from the company for a review. Since I've already used the product, I'm giving these to a reader! You'll get an 8ml Travel Size Sanitizing mist as well as a few of the cosmetic wipes. This is amazing for your kit. You can also keep it in your purse when going to makeup counters or Sephora. 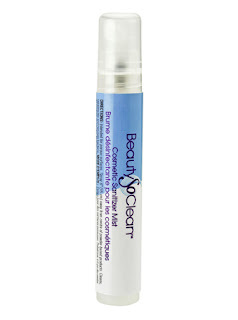 Spray some on makeup testers so you don't have to worry about the bacteria and build up before testing it. FTC Disclosure: I purchased this product with my own money prior to being contacted by the company for a review. The items for giveaway have been sponsored by the company. I am not affiliated with this company and have not been paid to write this review. I'd love to win this!! My friend got an eye infection last year from using her eyeliner so I know how important this stuff is! I'd love to get this and have a chance to try it! Bacteria is a huge concern when using makeup and I think people are more conscientious of that now more than ever. It's time consuming to use alcohol on everything and as you said wipe away all your powder products. I'd be able to put this product to good use, and thanks for your posts I look forward to reading them every week! I would love to win this product because anyone who uses makeup wants to look and feel better about themselves, so cleaning your cosmetic tools will insure that you are always looking and feeling your best. I'm so glad you're back on YouTube!! Yeah!! I hope you have another BlogTV session. Thanks for doing this contest and review. I never knew that using alcohol to sanitize your makeup would be so damaging to powder products. I would love to win this. I am prone to breaking out and would like to try this out to help properly sanitize my powder based make-ups. I have been so curious about this product! I would love to win this contest as I am in the process of becoming a Makeup Artist! I start my classes on Saturday and I have been really concerned about being sanitary so this would really help me feel better about it! Thanks for the review & contest RenRen! <3 ya! it would be cool to win!!! what a cool idea! That would be great for swaps too. Hey Ren Ren !!!! This product sounds like a dream come true! I would love to have it!! I too, am a germaphob when it comes to makeup. When my friends come over I cautious about letting them use my makeup... Id feel bad if i straight up told them no they cant use it... so i let them use but it but i always set it aside and when they leave i use rubbing alcohol to clean it **shhh!! its my secret... i dont want then to think im a freak.LOL Anyways Id love to have a product that helps me sanitize my makeup!! So far i've been lucky and haven't had any problems from not sanitizing my makeup, but i'm sure that my luck will expire... I need to prevent my next breakout /eye infection!, I feel it creeping up on mee ekkkkk!!! this stuff looks like it works wonders! I'm learning to be a MUA, and sanitizing is a must. I would love to try out this product. Thanx! I'm moving back to Hawaii and the weather there is hot'n'humid all year round, a perfect breeding ground for bacteria in everything including my make-up. Grosses me out just thinking about it, but this is an ideal product to help keep it all clean and sanitized. Thanks for the review! Oh wow Ren, I'd love to win this! I'm building my kit up for my cousin's wedding in April and this would be PERFECT! -Thanks! As a professional makeup artist, I'd love to win. Sanitation is so important in this profession - anything that makes the process of keeping things hygienic a little easier and less damaging to the products you're cleaning is fantastic. I would love to try this because I have the glazing poweder issue on my powder!! I would love to win this product, so it can help me maintain my makeup kit sanitized since I am an aspiring makeup Artist!!!! I want to be able to sanitize my products for a safer use!!! I would really love to win this product , because i already contacted beauty so clean and they don't ship to my country ! so i don't know where i can get it online ! I enjoyed very much watching your review on it . Thanks A lot! I would like to win this, because I really need to sanitize my make ups. I've been getting bad break outs probably due to my very old make ups that I use. Also thanks for this informative post, because I heard that you can sanitize make ups, but I don't know how, and I was afraid to ruin my make ups kits. I would love to win this product because 1) You made it sound absolutely unbelievable 2) I am as much of a clean freak as you are when it comes to make up and my clients 3) I'm just starting out as a makeup artist, but have a lot of photoshoots planned for the first 6 months of this year already. To have a product like this in my kit would be great! I neeeeed this! I have super oily skin and have def experienced having that glaze sneak up on some of my compacts! I would love to win this because I'm a germaphobe myself & am terrified of catching anything or having anyone else who's makeup I do catch something. It sounds like an amazing product! I would love it win this product being a makeup artist and a sanitizing freak as you are. I think this product will help me out in cleaning my products in a more efficient way and definitely it will cut down the time of doing it as well. I need this product in my kit. I am a germophobe so this is crucial. I would love to win this product. I have lots of makeup palettes and powder finishes and I always wonder how to santized them. I thought about doing the rubbing alcohol spray but thank goodness I didn't because of what may happen. Thanks for doing this review. You are the greatest! I'd love to win this for my daughter! She dances with a performing group and when she travels with her makeup, she usually shares with her girlfriends and I KNOW one day someone is going to end up with some type of icky eye infection! I love to keep things clean. Although I am not a MUA, I think that it is important to keep your own makeup clean and disinfected. I would love to test the product. I am a little lazy when it come to sanitizing my make-up but its a must and I need to stay away from bacteria. This is exactly what I've been looking for! I like applying makeup on others, especially my roommates. But I worry that some of their facial oils gets on my products and affects my skin. I want to help others look their best, but I always want to keep my stash clean and sanitized. I would really love to try this out! I would love the opportunity to use this product to test on myself and clients as well. I have OH SO sensitive skin-and know the importance of excellent sanitation practices! Thanks providing the reviews of the product! Keep 'em Comin'! My name is Diane Bootay and I would love to win this product because I am a make-up lover and now I can't buy make-up or any sanitary make-up stuffs at all. I lost my job for a year now and now I am going back to school for cosmetology because you have inspired me to do what I like to do BEST! Is working on our beautiful ladies and mens out there. If I am qualified for financial aide for school, I will continue it and go farther as I can. Thank You for your time to read this and I hope you can pick me as your winner. P.S. Keep up the good work you do for every lady and gentlemen around the world. I really inspired what you do for us. Hopefully what I learn from your Youtube.com will take me as far as you did. I want to do what you do BEST!! "A person who inspired that person will make this world a better place , like no other can. "-Diane B.
I would love to win this because I am just building my kit with the help of your advice, tips, and tricks! I'm a current follower here! I'd like to win this product bc I'd like to educate myself more when it comes to santizing makeup or makeup tools and also educate others who are new to using makeup. Wow. I'd love to get my hands on this. I had no idea that something like this even existed. My friend atteneded makeup school and I was really concerned with sanitation of makeup and she never really gave me a good answer. Now I think I've found it. Thanks Ren! I would love this product b/c I'm just starting out doing Free lance make-up and I'm still learning more about sanitizing and being clean when it comes to applying makeup on clients. This would be great to add to my kit. I definitely don't want one of my clients to get an infection of any kind and that's extremely important to me. I would love to win this as I have very sensitive skin and I know how important to have bacteria free makeup. I normally just discard makeup that looks like it's not so clean any more. This would save me soo much money. I would love to try it before I get the big bottle. Thanks for the review and your wonderful makeup tutorials. I have had consistent face breakouts over the last couple of months which I am just now figuring out is due to not sanitizing my products regularly. I would love to try this product but have a limited budget at this time. My self esteem has really gone down b.c. my skin is awful. I was on Accutane for awhile and was doing fine. I hope I am able to get my skin under control so I don't have to do it a second time. I would love to win this because the majority of the products I use are powders and this would really come in handy and would really help my skin which is acne prone + oily. I would like to win because until now, I didn't know how to desinfect my powders or eye shadows. I was just wiping them with a kleenex. It's always better when you know your product is clean! So thank you Ren Ren. Your a SkinSaver! wow i never knew a product like this even existed! this would really help me out to clean my kit and especially help me cut down on cleaning time between clients. this would be a life saver! Hi Ren, I would love to win because the sanitizing wipes and mist is something that I have been thinking about buying for a long time. I sent an email to you asking how you liked Beauty So Clean and you said you really liked it. I completely trust your judgement and I knew this is something I need for my kit and I would love to start sanitizing everything right away! Thank you, Ren! I'd love to win this because I'm a makeup junkie and a certified OC and this product will complete my OC-ness in me! Hi Renren! I've wasted so much powder foundation by wiping off first layer with kleenex. It'd be great to use this for a change! I don't have too much money to spend on makeup so I buy palettes, I'd hate to have to throw them all away on a count if accumulated bacteria. If this spray can prolong the life of my make-up, I'm all over it. I am a germophobe so I really would love to have these. I was not aware that you could disinfect makeup so I would throw mine away after I thought it was germy. Things have gotten so tight now that I have been using makeup that I know is not healthy so I am glad you recommend these. Now I know why my face is breaking out and my eyes are itchy. You were the first makeup artist that I subscribed to and I am learning so much from following you. Thanks for all the great advice and reviews. I would love to win this because after a past visit to the mac counter i vowed to never touch the testers again! It was soo gross! I hope to win this product, I have been using alcohol on my products. This products sounds amzaning and I'd love to try it. I'd love to win this cuz I would love to go back to using pressed powders on my face, I only use loose powder because I am afraid I'll break out but with this product I can easily clean pressed powder and protect myself from germs and breakouts. acne is definitely everybody's worse enemy! Since I got acne, I was hesitant to try out make up but ever since make up like these were introduced, I changed my mind. i would love to win this product because i have a lot of make-up and i use it on myself and my friends and i want to start doing make-up on others but i have no way of sanitizing. So winning this product would be very beneficial! I think the original price of this is worth it. It dries super fast. Less than 30 seconds and your product is dry. Thank you for sharing this, I'm prone to eye infections as well. Great review. Thanks for making the trustworthy attempt to talk about this. I think very robust about it and would like to learn more. If it’s OK, as you acquire more in depth knowledge, could you thoughts adding extra articles similar to this one with more information? It will be extraordinarily helpful for me and my friends. I would love to win this item. As i have developed an allergy to all my eyeshadows .my eyes are so swollen and feel like sand paper im so fed up. I love wearing eyeshadow i feel so bare without it help?